First off, just as a warning to any less experienced players, walljumping is absolutely required from the very beginning. Other techniques that are required to complete the game are 'infinite' one-wall walljumping, single bombjumping, and the midair morph. Some madd crumble block skillz are also required. As with most hacks, 'infinite' bombjumping is not required. Similarly to Dependence, save states are required because sadly there are no consistant, reliable regular save points. They cause even worse errors in this game when implemented than they did in Dependence. Try to keep a backup savestate, also. While this game has been playtested a lot and you shouldn't be able to get truly stuck at any point, as with almost any game, you can never rule out the possibility that you could get into a difficult area with low health and have a tough time escaping or something of that nature. Physical difficulty (i.e. the need for feats of manual dexterity) is definitely stepped up from Dependence. Also, unlike that hack, this one is less nonlinear in the order of the bosses you fight and items you collect, although path you follow through the areas may be quite nonlinear, most notably the many connecting passages throughout the opening area. It's still about as nonlinear as most other hacks out there though. If you come across any of these, it isn't necessary to report them, as they're already known, just either are impossible to fix or would require an inordinate amount of effort to fix. 1. 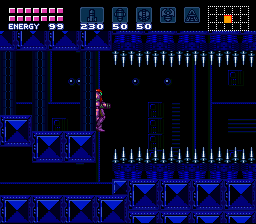 In a room with a silver Chozo or rising/lowering pipes, if you jump or move at the right angle, you may notice a small segment of said item flashing for a second or so in an out of place part of the room. This little bug is innate to the SM engine; the SM programmers merely worked around it by not using these in ways in which might cause this little graphical glitch. Dependence probably had a few instances of this glitch as well. 2. A few doors have a brief graphic glitch during door transition in a specific direction. This bug is also innate to the SM engine - but once again, with the way the programmers used the tilesets in the normal SM, you never had a chance to see any of these little glitches. Dependence and some other hacks also have this in a few areas. 3. In a few specific rooms throughout the game (maybe 4 or 5), if you pause, you may notice a glitched up map screen. Do not fear; this is not permanent. If you leave that room and pause in one of the vast majority of rooms, you'll see that your map is still in correct working order. 4. Occasional background blending issues in some sky rooms. You may want to refrain from pausing the game during certain boss battles unless you really need to or else YOU WILL DISCOVER THE TERRIBLE, TERRIBLE SECRET OF SPACE. If you manage to sequence break to get into the EH using infinite bomb jumping, you will have to infinite bomb jump again to progress in there. You have been warned. For half of the escape, for a certain reason, you will not be able to read the countdown timer. Unfortunately, it's the latter half. However, it also adds the interesting dimension of uncertainty as to how much time is left. 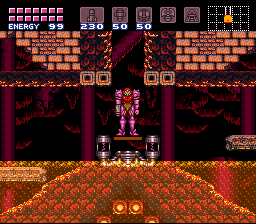 If you should, through use of frame advance or insane Super Metroid skillz, get up a certain spikelined shaft with super missile blocks that close off the top WITHOUT the space jump, keep an extra save state handy before you go further, or else, if you continue on, you'll get stuck near the end.